You log into Snapchat. You see that wonderful fire symbol next to the name of your best friend. The number is growing daily. You are enjoying your best ever Streak (officially known as a Snapstreak). You’ve become a Snapchat master! Then the worst thing that could possibly happen happens. Unexpectedly, you’ve lost your Snapchat Streak. Your life is ruined. But don’t panic! You can sometimes get your Streak back, and in this article we explain how to do just that. Let’s start with the basics. Some of you may not know exactly what a Streak entails or its benefits. You’ll need to understand these if you want to know how to get a Snapstreak back. This isn’t a solo effort by any means—this is a demonstration of your friendship. You have to rely on someone else. You can either overtly tell your friend you want to try for a Snap Streak, or it might be an unspoken agreement. A Streak begins when you and a friend send Snaps to each other every 24 hours for 3 consecutive days. Once you’ve done this, a fire emblem will appear next to that contact’s name, alongside a tally of how many days the Streak has lasted. The rules are simple: you have to send a Snap to that person each day. They have to respond to your Snap within 24 hours. Chats don’t count. Neither do Snaps sent from Memories or from Snapchat Spectacles. Video calls don’t either. However, videos sent through the Snap function do. And remember that this is about individuals, so sending a Snap to a group or adding one to My Story doesn’t add towards a Streak. What are the benefits of maintaining a Snapchat Streak? Bragging rights. That’s essentially what you’re aiming for here. The more you Snap, the higher your in-app score. Confused? Here’s how your Snapchat score works. It’s a numerical valuation of how dedicated you are to the social network. What Do Snapchat’s Emojis Mean? Firstly, note that these emojis are different from Trophies, although the more Streaks you take part in, the more likely you are to earn Snapchat Trophies. Go to the Chat function and you’ll see your contacts. Emojis will accompany some of these names, if not all of them (depending on how many friends you’ve added and how frequently you communicate with them). If you’re consistently sending messages to one person, a smiley face will appear to the right of their name. This signifies that you’re best friends. This will certainly appear if you’re participating in a Snap Streak with someone. If your Streak reaches 100 days, Snapchat will congratulate you by putting the “100” emoji next to the flame symbol. Beyond that, it will simply continue to list the number of consecutive days you’ve been on this current Streak. No one’s perfect, so one party will inevitably forget they’ve not sent a Snap within 24 hours of the previous one. Snapchat has you covered—it’ll remind you by showing an hourglass emoji by your Streak number. If you see an hourglass, send a Snap! If you’re worried the other person has forgotten too, send them a message on Chat and hope they have notifications turned on. 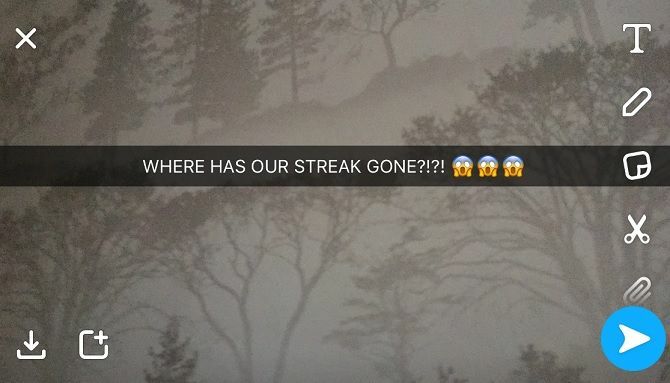 How can you keep a Streak going? The secret is not to get too precious about what you take a picture of. You won’t find something meaningful to say every day, so don’t feel too bad if you Snap the ceiling. Add text to explain that this is to maintain the Streak; alternatively, send a nice “thinking of you” message. You can always make your Snaps more interesting by using filters. Here’s a list of the best Snapchat lenses to bring some variety to your pictures and videos. Why Did You Lose Your Snapchat Streak? The most obvious reason is that either yourself or your friend hasn’t sent a Snap within the past 24 hours. But don’t immediately blame the other person; sometimes it isn’t anyone’s fault. Often, connectivity issues plague the app. 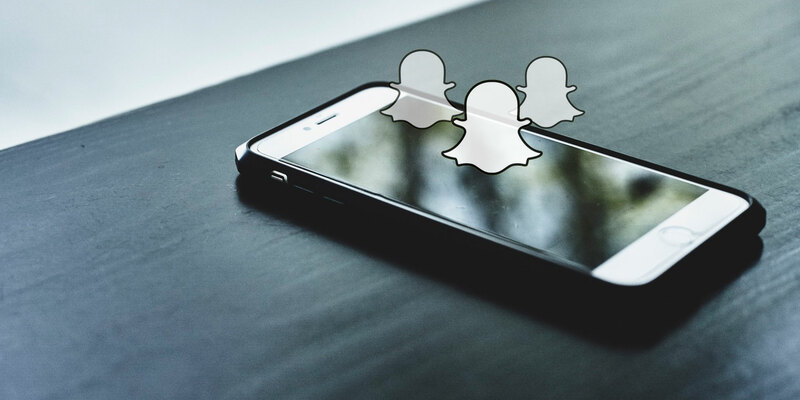 If one of you has problems connecting to the internet, Snaps could fail to send; in such cases, Snapchat should tell you a Snap wasn’t delivered. You can try again, but make sure you’ve got Wi-Fi. Otherwise, you’ll have to send at a later time (which is why it’s a good idea to start a Streak when you know you’ll be at home during certain hours every day). There may also be an issue with hardware or operating systems. Sadly, if this carries on for a few days, your Streak won’t be the only victim. Your “best friend” status will also vanish. However, many report that both parties sent Snaps, but the Streak nonetheless disappeared. No one really knows why—but most blame a bug within the app. Especially if you’ve just installed an update. Watch out for other glitches within Snapchat, including Opened Snaps not disappearing from the Chat timeline. Fortunately, in most of these instances, you can get your Streak back. Snapchat recognizes and appreciates its dedicated userbase, and further that some things are out of our control. That’s why there is a way you can get your Snapstreak reinstated. To do so, you need to appeal to Snapchat. Before we go into details, you should know that there are provisos. Notably, you can’t do it regularly. Don’t get into the habit of losing your Streak and appealing to Snapchat. They won’t fall for it. Secondly, if numerous Streaks have disappeared, this method will likely only work with one contact. Certainly there’s a limit of one username per submission. Make your longest-running Streak the priority. 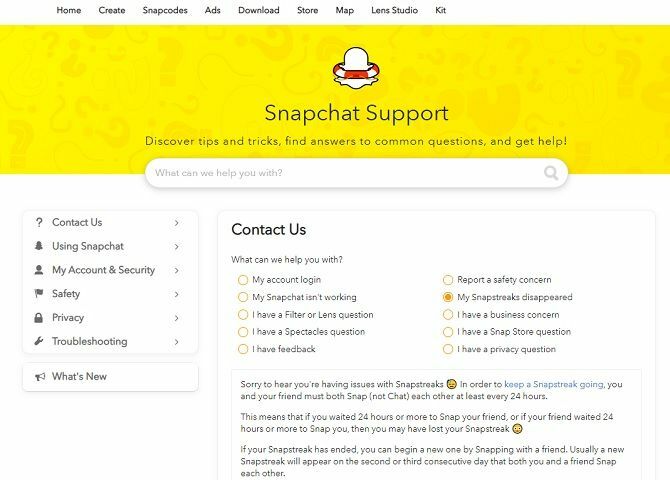 Go to Snapchat Support. You’ll see a list of potential problems; click on My Snapstreaks disappeared. A contact form will load underneath details about Streaks. This will require basic information about your account (username, email address, cell number, and device) then specifics about the Streak. Include as many details as you can. Fingers crossed you can remember how many consecutive days your Streak lasted for. If not, ask your friend. Failing that, estimate. There’s space later in the form to say it’s an approximation. Similarly, if you know an exact date you lost your Streak, that’s useful data. However, you can also say the issue occurred since you installed the latest update. Be honest. Tell Snapchat if the app wouldn’t load, a Snap just wouldn’t send, or if your internet connection failed. Send your request and wait for a reply. Why Won’t Snapchat Help Me? The social network won’t reinstate your Streak if it just naturally waned. It doesn’t matter if you were nearing 1000 days: if someone forgot, that’s on your own heads. Of course, you could lie and say something went wrong with the app. But we don’t advocate that, as your conscience will eventually get the better of you. Or maybe the service doesn’t think you’re deserving enough. It’s far from perfect. However popular it is, even its core audience knows there’s a lot wrong with Snapchat.